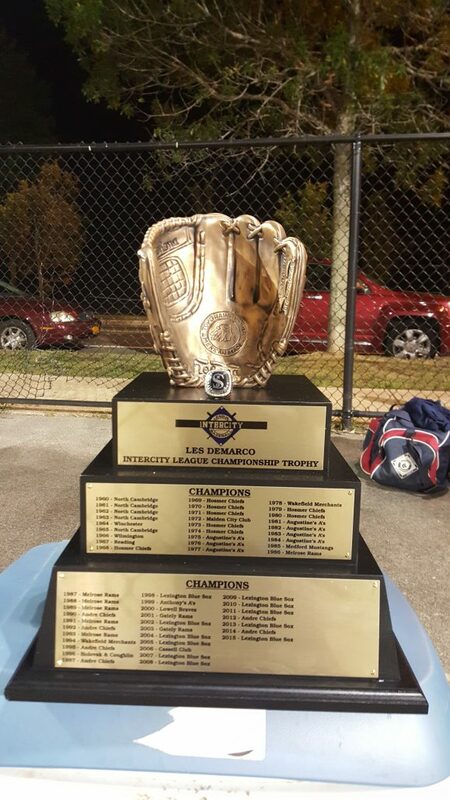 Melrose – Dorian Rojas singled to left to drive in Jeff Vigurs with the championship-winning run in the bottom of the tenth giving Lexington its third consecutive title and 13th overall. Vigurs lead off the tenth with a bunt single against J. P. Songin, who had taken the hill for Reading to start the inning. Dan Graham reached base on a cue-shot down the third base line putting runners on first and second. Julian Alvarez sacrificed both runners into scoring position. Ross Curley was intentionally walked to set up a force out at any base. With the infield drawn in, Rojas lined a 2-0 fastball into left to bring home Vigurs and begin the celebration by the Blue Sox. 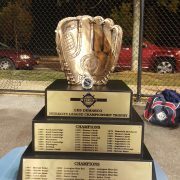 This is the fourth season the finals have been held at Morelli Field and is the second walk-off championship win for the Blue Sox at Morelli. Both of come in extra innings as the Sox beat Andre 16-15 in nine innings in 2015. Lexington took a 1-0 lead in the first on an RBI double by Curley that scored Jeff Costello, who reached on an error to start the game. The 1-0 lead held up until the sixth when Reading tied the game. Darren Hartwell started the inning with an infield single. He was sacrificed to second and then scored on Mike Taylor’s single to right. It was the fourth straight Bulldog run that Taylor drove in. In what was the best game of the finals, both teams had scoring opportunities during the game, but kept coming up empty due to clutch pitching and outstanding defense. The Bulldogs had only three base runners in the first five innings on two hits, one being a two-out double by Hartwell, and a walk. They finally broke through in the sixth, but stranded runners at first and third. In the seventh Reading’s Steve Busby singled to lead off the inning. He was sacrificed to second and after Johnny Hayes struck out for the second out, Hartwell was intentionally walked, putting runners at first and second. Hartwell came into the game hitting .417 in post season play and had two hits in the game. Kevin Marciano hit a high-chopper in front of the mound which Sox hurler Rob DiFranco fielded but could not throw out Marciano. Busby rounded third and attempted to score, hoping to catch the Blue Sox sleeping, but was gunned down on a great throw from Vigurs to John Puttress to end the inning. That was the final threat for Reading as the Sox bullpen shut down the Bulldogs over the last three innings, allowing only one base runner. DiFranco combined with fellow moundsman Jeff Blout, who picked up the win in relief, to set down eight straight Bulldogs, five by strikeout, and nine of the last 10 Reading batters. Lexington had at least one base runner in each of the first five innings, leaving a runner at second in the first, second and fourth innings. In the fifth the Blue Sox loaded the bases on a single and two walks with one out. Jack Burke took the hill for Reading and walked the first batter he faced, but then got out of the jam with a strikeout and a ground out. Burke then combined with Jack Theriault to set down 13 consecutive Blue Sox batters from the fifth through ninth innings before Josue Feliciano snapped the streak with a two-out single. In the first two games of the finals the teams combined for 19 runs and 36 hits in 14 innings. Tonight in 10 innings, they scored three runs and had 14 hits. This was the third straight championship game that was decided by a run. Lexington 16-15 in 2015 and 5-4 last season. Once again the curtain has closed on another outstanding Intercity League season. As the lights go out at Morelli Field for the final time the Intercity League would like to thank all the fans who have supported each team through out the season.